Autumn inspires us! The past month we’ve been designing with thoughts of fall…a copper container, a beautiful basket, a heavy stone trough, and even something as simple as a wooden box made wonderful starting pieces for a few of them. It’s funny how something can sit and not be noticed until a design brings it to life. Jamie did just that with this large basket. It and another like it have been in the greenhouse for awhile now. They’ve held bags of moss or been propped up waiting for someone to notice them. Well, her design certainly does it justice! It’s been the showstopper of the season with her use of bittersweet, giant star pod and Indian corn. 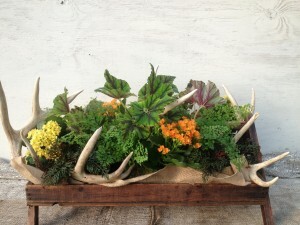 This wooden box arrangement was done for a garden club – the customer brought in the antlers! This one was a fun change of pace. Those antlers didn’t want to stay put, and the box was a tad rickety…it reminds us that each day may bring different and interesting challenges! 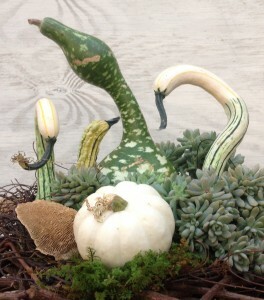 Soon the gourds will be gone for the season…but I’ll remember this arrangement as one of my favorites from this fall. I enjoy the lines of the gourds and the interplay of form here. 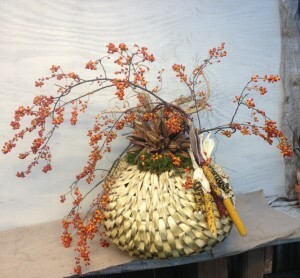 This entry was posted in Arrangements, Baskets, Container, Fall, Flowers, Orchids and tagged arrangements, baskets of bittersweet, containers, fall arrangements, gourd arrangements, orchid on November 2, 2013 by Kris Blevons.